Bushiroad and the Japanese retail chain FamilyMart announced a collaboration at more than 7000 participating FamilyMart and Circle K Sunkus convenience stores. Beginning May 25th, customers will be able to buy two-pack sets of V-Booster Set 01: Unite! Team Q4 for 650 yen. (Tax not included.) 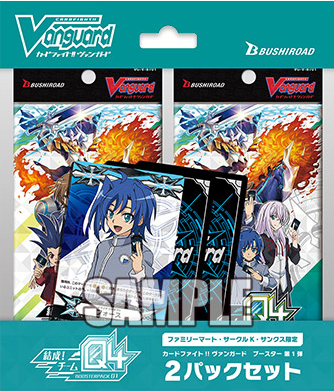 These sets come with three promotional cards, the TV schedule Blaster Blade, an alternate artwork version of Wingal with its Trial Deck skill, and a Sendou Aichi Force Gift Marker. Their respective card numbers are VPR/0001, V-PR/0022, and V-GM/0016, and the key art used for the Marker differs from the one used for the booster set's own promo card campaign and Secret Rare. Buying two copies of the set will still get users the promo card pack for buying 4 booster packs. The special 2 pack set.